Rocamadour, Payrac and others. Find out what the Lot has in store for you! You'll be delighted by Rocamadour, Payrac and the surrounding region during your camping holiday! Here at Yelloh! Village Payrac Les Pins, between Sarlat and Rocamadour, not far from the Padirac Chasm and the Lascaux Caves, you’ll be ideally placed to discover all the wonders of the Dordogne Valley. Take your time to explore the steep pathways of the village of Rocamadour, a major stopping-off point on the Way of Saint James and a high point of Christian spirituality, that seems to cling so precariously to its cliffside, or the charming narrow streets of villages such as Loubressac, Carennac, Autoire, Saint-Cirq-Lapopie and La Roque-Gageac. Take a journey out of time as you descend into the depths of the Padirac Chasm or the Lacave caves. Follow in the footsteps of early man with the sublime cave-paintings in the Lascaux, Cougnac and Pech Merle caves. And don’t leave our region without having tasted a veritable Périgord salad with its walnuts, slices of smoked duck breast and foie gras, our duck confit with Sarlat-style potatoes, rocamadour cheese, all washed down by our black Cahors wine strongly marked by its rocky terroir. Every Sunday, during our welcome cocktail, come and join us to discover our top tips for your holiday and all our favourite addresses. We know just how to help you organise your stay and make the most of every moment: the best spots for bathing, most gorgeous walks, tastiest restaurants... All the information you need is waiting for you at reception, as soon as you arrive here at the campsite. Not far from the campsite you’ll find a host of fascinating villages each listed amongst the most beautiful in France! With the family or with your friends, set off to discover the fabulous caves and chasms to be found near the campsite. The Padirac Chasm and the Lascaux Caves are particularly popular in July-August. We recommend booking your tickets online before you arrive at the campsite. For a leisurely stroll or to travel back through history, take time out to visit the gardens, castles and châteaux in the surrounding area. Looking for an activity or somewhere interesting to visit for an enjoyable moment with the family? Discover our selection of parks, shows and unmissable places in the region. Looking to spend time on or by the water, to relax or simply have fun? Check our list of nearby beaches and other points of interest. Serious foodie or simply looking to enjoy the good things in life? 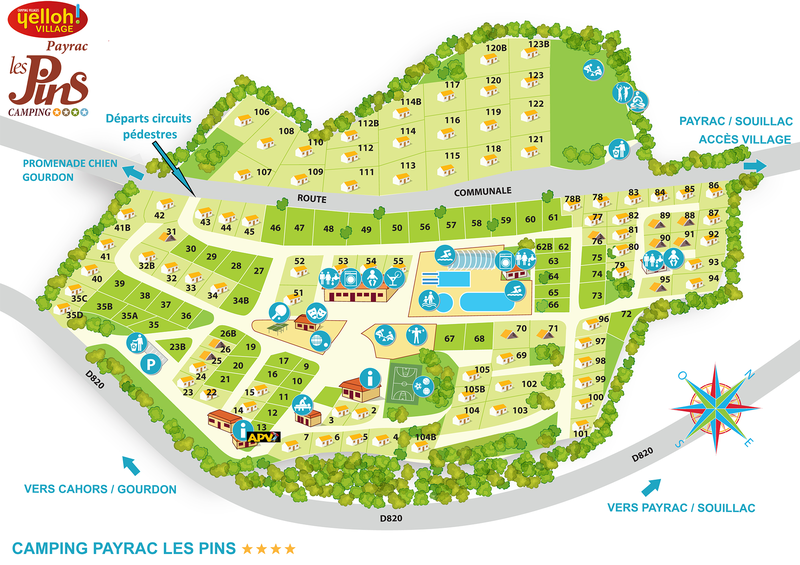 During your stay at the Payrac Les Pins campsite discover the many farms close by. Uncover all the secrets of making rocamadour cheese or foie gras, milking goats or harvesting the black gold of the Périgord (truffles).